The morning I was leaving for Atlanta to participate in the 1996 Olympic Games, I walked into the kitchen to find my parents acting very strangely. After a few minutes of strained conversation and feeling like the floor was made of eggshells, I finally just asked what the heck was wrong with everyone. There had been a bombing in Centennial Park. Obviously, I had no choice – I was going to fly to Atlanta regardless of the bombing, but I can’t imagine what my parents were feeling, especially my mom. A few days later, my dad would drive to Atlanta to watch me run. Maybe it was because I hadn’t seen any coverage of the bombing on TV, or maybe it was the fact that I was younger and not yet so fearful about the world my baby daughter was going to grow up in, but I was essentially unconcerned. Maybe it was because September 11 hadn’t happened yet. On Monday morning, I went running in Brandywine Creek State Park with my friends, enjoying the beauty of the trails and the fact that, after all these years, I still so much love getting out and running. After a quick trip to Trader Joe’s, I had to buckle down and write my column for today. I knew I wanted to write about the Boston Marathon. About how I love the fact that it is still the one road race that people have to qualify for – it gives runners that extra goal to shoot for. Anyone can sign up for almost every race, but not Boston. Like the Olympic trials, just getting there is a huge accomplishment. I had trouble buckling down and getting to work, mostly because I found a live stream for the Boston Marathon and I watched the last 45 minutes of the elite women’s race and the progress of the elite men. Once I saw Shalane Flanagan and Kara Goucher cross the finish line, I was able to move on with my day, but I looked forward to checking up on the local runners who had made the trip to Boston. On the morning of Sept. 11, 2001, I had just finished dropping our daughter off at school and had started straightening up the house as our 4-month-old son napped. The phone rang, and it was my mother-in-law calling to tell me that New York was on fire. For however many hours, I watched TV, tears streaming down my face. I hugged my baby and decided to get my daughter and nephew from school early. I paced until Rudy came home from work and kept in contact with all my relatives. I just wanted my family together. On Monday, after finishing my column and walking the dog, I settled down to fold laundry and watch reruns of the “Housewives.” My phone indicated that I had a text message. The message was from a friend and said, “OMG....Explosions at Boston Marathon.” I found myself, again, watching TV and crying. I immediately checked Facebook and quickly scrolled down the postings to see how many of my running family and friends wrote to say they were OK. I texted women from the company I work for, there for the marathon expo, to make sure everyone was accounted for. We lost so much on Sept. 11 – the people who perished in the towers, the famous skyline of New York City, our innocence. We wondered how anyone could do something like this, and if we could ever recover from it. While there has not been a tragedy of that scale since, there have been too many tragedies. School shootings, city bombings, terroristic plots uncovered. How can we recover? We will recover. 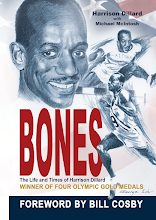 What happened in Boston will not stop people from running or keep them from racing. However, I was over 30 when I lost my innocence about the world. On Monday, I not only cried for the lives lost, the people hurt and the city of Boston. I cried for the fact that our children have lost their innocence at such an early age. Vicki Huber represented the USA in the 1988 (6th place, 3000 meters) and 1996 Olympic Games (1500 meters). 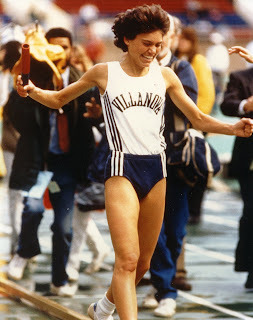 While at Villanova, she won 8 individual NCAA titles (3 indoor and 3 outdoor titles at 3000 meters in 1987, 1988, and 1989, the 1988 indoor mile, and the 1989 cross country individual title). Huber was USATF national champion in the 1500 meters in 1988, set a USA 5K record, and was 4th at the 1992 World Cross Country championships.